Four bedroom, two bath, sleeps 8. Very clean, nicely furnished townhouse, located five minutes from North Conway Village with tax-free shopping and dining. The White Mountains National Forest begins ten feet from our deck. Hike and cross-country ski from the back door. Swim, bike and rock climb at Echo Lake and famous Cathedral Ledge (one-half mile away). Fish, kayak, and canoe the Saco River (one mile away). Horseback riding and sleigh rides within one mile. Several golf courses and Storyland are less then fifteen minutes away. If it is skiing, snowboarding and snow tubing that you love, we are ten minutes from Attitash, Bear Peak, Mount Cranmore and twenty minutes from Wildcat and Brenton Woods. The wonderful colors of fall bring vacationers from all over to enjoy this area. Our home is charming and comfortable with over 2200 square feet of living space. We have three bedrooms plus a loft. Two bedrooms have queen-size beds. The third bedroom and loft each have two twin beds. The family room has a gas fired stove, wet bar, refrigerator and foosball table for your family to enjoy. You will have all the comforts of home and are perfectly located for year-round enjoyment in the North Conway, Mount Washington Valley area. Very nice condo with everything you need to make your stay comfortable. This place was clean and and just as is in the pictures! It worked perfectly for our two families. Everyone had a space ! The extra living space in the basement was a bonus to have for all the kids and adults to hang out in ! Thank you ! Great spot for a ski weekend! Close to all of the activity and very comfortable. We even got a Pats win during our stay!! Lisa was wonderful to deal with! We could not have imagined a better place for a wonderful family vacation. It was the perfect backdrop for our holiday. The house had everything that we needed to relax and connect as a family. We really enjoyed our time at the house and would love to return again to make more memories. We really enjoyed our stay in this secluded spot. It was very comfortable for the four of us leaf peepers. The location made seeing all the attractions easy. When we return to this area, this place would be at the top of our list. Much bigger than it looks! Our adult family of 5 had a great 6 night stay in this home. It is located off West Side Road, across the Saco River from North Conway itself, but is only a 5 minute drive from the shops and restaurants. 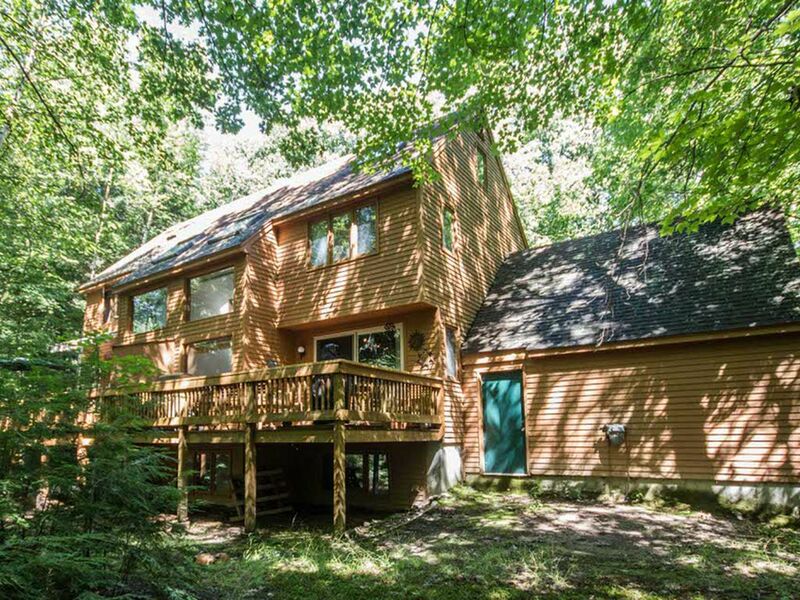 It is quietly located in the woods and has 4 levels with 4 bedrooms, generous living space and even a second kitchen and living space in the basement. It's fully equipped, clean and Lisa is very helpful with instructions on how to collect the key and find the property. We had a great time staying here and thoroughly recommend this home to anyone wanting a great vacation time in New Hampshire. Our deck is ten feet from the White Mountain National forest. Hike or cross county ski from the back door. Swim, bike, and rock climb at Echo Lake and famous Cathedral Ledge. Fish, kayak and canoe the Saco River. There is also a beautiful golf course and horseback riding all located within one mile. Or just shop and see the sites. North Conway offers every kind of tax free outlet shopping. Storyland, a family favorite, and all the valley attractions are close by. If it is skiing, snowboarding or snow tubing you love, we are ten minutes from family friendly Mt. Cranmore and Attitash Bear Peak. Wildcat, Pinkham Notch, and Bretton Woods are fifteen minutes away.